« Guam: Shop til you drop! Favorite photo of Sport ~ enjoying a run during our Volksmarch. I heard they were used for oil as well. 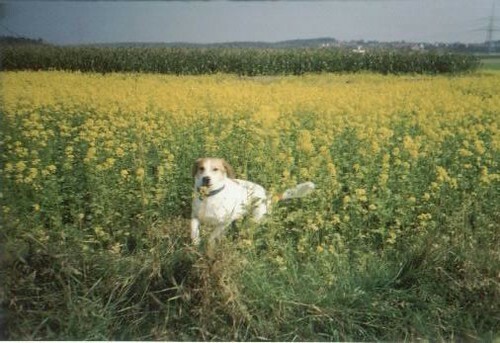 I loved the story about the lady at the market ~ I had never heard the “makes you horney” reference but it’s a good thing Sport was neutered since he loved running through those fields of yellow flowers. Gosh! I remember all those yellow flowers that literally covered Bavaria and all the furniture in my house! Someone told me that they used them for a perfume or oil. Here’s quick funny story about those flowers. A friend and I were pushing our 1 year olds in umbrella strollers through the square in Amberg during the Saturday market. I was about 6 months pregnant with Vincent and a nice lady tried to sell me some of those flowers. I just said “no thank you” and smiled. She was very persistant and asked again. I just smiled again and “nein, danke”. We continued to walk by her booth and she said “makes you horney” (in English!) I said…I’ve had enough of that and pointed to my pregnant belly. My friend and I were cracking up. I guess she really wanted me to have those flowers!